"Lewis Richardson" redirects here. For the Hollyoaks character, see Lewis Richardson (Hollyoaks). Lewis Fry Richardson, FRS (11 October 1881 – 30 September 1953) was an English mathematician, physicist, meteorologist, psychologist and pacifist who pioneered modern mathematical techniques of weather forecasting, and the application of similar techniques to studying the causes of wars and how to prevent them. He is also noted for his pioneering work concerning fractals and a method for solving a system of linear equations known as modified Richardson iteration. Lewis Fry Richardson was the youngest of seven children born to Catherine Fry (1838–1919) and David Richardson (1835–1913). They were a prosperous Quaker family, David Richardson operating a successful tanning and leather manufacturing business. At age 12 he was sent to a Quaker boarding school, Bootham School in York, where he received an education in science, which stimulated an active interest in natural history. In 1898 he went on to Durham College of Science (a college of Durham University) where he took courses in mathematical physics, chemistry, botany, and zoology. He proceeded in 1900 to King’s College, Cambridge, where he was taught physics in the natural sciences tripos by (among others) J. J. Thomson and graduated with a first-class degree in 1903. At age 47 he received a doctorate in mathematical psychology from the University of London. chemist, National Peat Industries (1906–1907). manager of the physical and chemical laboratory, Sunbeam Lamp Company (1909–1912). Manchester College of Technology (1912–1913). Meteorological Office – as superintendent of Eskdalemuir Observatory (1913–1916). Friends Ambulance Unit in France (1916–1919). Meteorological Office at Benson, Oxfordshire (1919–1920). Head of the Physics Department at Westminster Training College (1920–1929). Principal, Paisley Technical College, now part of the University of the West of Scotland (1929–1940). Richardson's Quaker beliefs entailed an ardent pacifism that exempted him from military service during World War I as a conscientious objector, though this subsequently disqualified him from having any academic post. Richardson worked from 1916 to 1919 for the Friends' Ambulance Unit attached to the 16th French Infantry Division. After the war, he rejoined the Meteorological Office but was compelled to resign on grounds of conscience when it was amalgamated into the Air Ministry in 1920. He subsequently pursued a career on the fringes of the academic world before retiring in 1940 to research his own ideas. His pacifism had direct consequences on his research interests. According to Thomas Körner, the discovery that his meteorological work was of value to chemical weapons designers caused him to abandon all his efforts in this field, and destroy findings that he had yet to publish. "After so much hard reasoning, may one play with a fantasy? Imagine a large hall like a theatre, except that the circles and galleries go right round through the space usually occupied by the stage. The walls of this chamber are painted to form a map of the globe. The ceiling represents the north polar regions, England is in the gallery, the tropics in the upper circle, Australia on the dress circle and the Antarctic in the pit. A myriad computers are at work upon the weather of the part of the map where each sits, but each computer attends only to one equation or part of an equation. The work of each region is coordinated by an official of higher rank. Numerous little "night signs" display the instantaneous values so that neighbouring computers can read them. Each number is thus displayed in three adjacent zones so as to maintain communication to the North and South on the map. When news of the first weather forecast by the first modern computer, ENIAC, was received by Richardson in 1950, he responded that the results were an "enormous scientific advance." The first calculations for a 24-hour forecast took ENIAC nearly 24 hours to produce. [A play on Siphonaptera, Augustus De Morgan's rewording of Jonathan Swift, "Great fleas have little fleas upon their backs to bite 'em, And little fleas have lesser fleas, and so ad infinitum." (A Budget of Paradoxes, 1915)]. One of Richardson's most celebrated achievements is his retroactive attempt to forecast the weather during a single day—20 May 1910—by direct computation. At the time, meteorologists performed forecasts principally by looking for similar weather patterns from past records, and then extrapolating forward. Richardson attempted to use a mathematical model of the principal features of the atmosphere, and use data taken at a specific time (7 AM) to calculate the weather six hours later ab initio. As meteorologist Peter Lynch makes clear, Richardson's forecast failed dramatically, predicting a huge 145 hectopascals (4.3 inHg) rise in pressure over six hours when the pressure actually was more or less static. However, detailed analysis by Lynch has shown that the cause was a failure to apply smoothing techniques to the data, which rule out unphysical surges in pressure. When these are applied, Richardson's forecast is revealed to be essentially accurate—a remarkable achievement considering the calculations were done by hand, and while Richardson was serving with the Quaker ambulance unit in northern France. Richardson also applied his mathematical skills in the service of his pacifist principles, in particular in understanding the basis of international conflict. For this reason, he is now considered the initiator, or co-initiator (with Quincy Wright and Pitirim Sorokin as well as others such as Kenneth Boulding, Anatol Rapaport and Adam Curle), of the scientific analysis of conflict—an interdisciplinary topic of quantitative and mathematical social science dedicated to systematic investigation of the causes of war and conditions of peace. As he had done with weather, he analysed war using mainly differential equations and probability theory. Considering the armament of two nations, Richardson posited an idealised system of equations whereby the rate of a nation's armament build-up is directly proportional to the amount of arms its rival has and also to the grievances felt toward the rival, and negatively proportional to the amount of arms it already has itself. Solution of this system of equations allows insightful conclusions to be made regarding the nature, and the stability or instability, of various hypothetical conditions which might obtain between nations. He also originated the theory that the propensity for war between two nations was a function of the length of their common border. And in Arms and Insecurity (1949), and Statistics of Deadly Quarrels (1960), he sought to analyse the causes of war statistically. Factors he assessed included economics, language, and religion. In the preface of the latter, he wrote: "There is in the world a great deal of brilliant, witty political discussion which leads to no settled convictions. My aim has been different: namely to examine a few notions by quantitative techniques in the hope of reaching a reliable answer." In Statistics of Deadly Quarrels Richardson presented data on virtually every war from 1815 to 1945. As a result, he hypothesized a base 10 logarithmic scale for conflicts. In other words, there are many more small fights, in which only a few people die, than large ones that kill many. While no conflict's size can be predicted beforehand—indeed, it is impossible to give an upper limit to the series—overall they do form a Poisson distribution. On a smaller scale he showed the same pattern for gang murders in Chicago and Shanghai. Others have noted that similar statistical patterns occur frequently, whether planned (lotteries, with many more small payoffs than large wins), or by natural organisation (there are more small towns with grocery stores than big cities with superstores). Richardson decided to search for a relation between the probability of two countries going to war and the length of their common border. However, while collecting data, he found that there was considerable variation in the various published lengths of international borders. For example, that between Spain and Portugal was variously quoted as 987 or 1214 km, and that between the Netherlands and Belgium as 380 or 449 km. 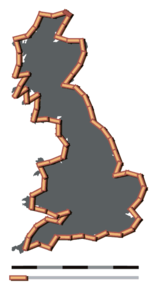 Notice that the smaller the ruler, the longer the resulting coastline. It might be supposed that these values would converge to a finite number representing the true length of the coastline. However, Richardson demonstrated that this is not the case: the measured length of coastlines, and other natural features, increases without limit as the unit of measurement is made smaller. This is known nowadays as the Richardson effect. At the time, Richardson's research was ignored by the scientific community. Today, it is considered an element of the beginning of the modern study of fractals. 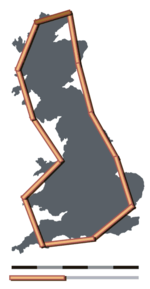 Richardson's research was quoted by mathematician Benoît Mandelbrot in his 1967 paper How Long Is the Coast of Britain? Richardson identified a value (between 1 and 2) that would describe the changes (with increasing measurement detail) in observed complexity for a particular coastline; this value served as a model for the concept of fractal dimension. In April 1912, soon after the loss of the ship Titanic, Richardson registered a patent for iceberg detection using acoustic echolocation in air. A month later he registered a similar patent for acoustic echolocation in water, anticipating the invention of sonar by Paul Langevin and Robert Boyle 6 years later. A fictional version of Richardson, named Wallace Ryman, plays a pivotal role in Giles Foden's novel Turbulence. Richardson is mentioned in John Brunner's work, Stand on Zanzibar where Statistics of Deadly Quarrels is used as an argument that wars are inevitable. Richardson's work is also mentioned in Poul Anderson's speculative fiction novelette, Kings Who Die. In 1909 he married Dorothy Garnett (1885–1956), daughter of the mathematician and physicist William Garnett. They were unable to have children due to an incompatibility of blood types, but they adopted two sons and a daughter between 1920 and 1927. Richardson's nephew Ralph Richardson became a noted actor. His great-nephew (through his wife Dorothy's eldest brother, (James Clerk) Maxwell Garnett, C.B.E. ), Julian Hunt, went on to become a meteorologist and director general and chief executive of the British Meteorological Office from 1992 to 1997. A great-niece- of the same line of descent- is the politician Virginia Bottomley. Since 1997, the Lewis Fry Richardson Medal has been awarded by the European Geosciences Union for "exceptional contributions to nonlinear geophysics in general" (by EGS until 2003 and by EGU since 2004). Since 1959, there has been a Peace Studies centre at Lancaster University named the Richardson Institute which carries out interdisciplinary research on peace and conflict in the spirit of Lewis Fry Richardson. ^ a b c Gold, E. (1954). "Lewis Fry Richardson. 1881-1953". Obituary Notices of Fellows of the Royal Society. 9: 216. doi:10.1098/rsbm.1954.0015. JSTOR 769208. ^ O'Connor, John J.; Robertson, Edmund F., "Lewis Fry Richardson", MacTutor History of Mathematics archive, University of St Andrews . ^ Bootham School Register. York, England: BOSA. 2011. ^ "Lewis Fry Richardson" (PDF). Archived from the original (PDF) on 5 May 2016. Retrieved 30 January 2019. ^ "Royal Society election citation EC/1926/21". The Royal Society. 1926. Archived from the original on 13 January 2013. Retrieved 21 January 2008. ^ Peter Lynch (2008). "The origins of computer weather prediction and climate modeling" (PDF). Journal of Computational Physics. University of Miami. 227 (7): 3436. Bibcode:2008JCoPh.227.3431L. doi:10.1016/j.jcp.2007.02.034. Archived from the original (PDF) on 8 July 2010. Retrieved 23 November 2010. ^ Richardson, Lewis Fry (1922). Weather Prediction by Numerical Processes. Boston: Cambridge University Press. p. 66. ISBN 9780511618291. Retrieved 2019-02-23. ^ Lewis F. Richardson (1961). "The problem of contiguity: An appendix to Statistics of Deadly Quarrels". General systems: Yearbook of the Society for the Advancement of General Systems Theory. Ann Arbor, Mich.: The Society, [1956–: Society for General Systems Research. 6 (139): 139–187. ISSN 0072-0798. OCLC 1429672. In the previous section integrals were taken around simple geometrical figures, as a preliminary to taking them around frontiers shown on political maps. An embarrassing doubt arose as to whether actual frontiers were so intricate as to invalidate that otherwise promising theory. A special investigation was made to settle this question. Some strange features came to notice; nevertheless an over-all general correction was found possible. The results will now be reported. ... As an explanation of how chance can arise in a world which he regarded as strictly deterministic, Heri Poincare* (no date) drew attention to insignificant causes which produced very noticeable effects. Sea coasts provide an apt illustration. ^ P. G. Drazin, "Fractals"; Collected Papers of Lewis Fry Richardson, Volume 1; Cambridge University Press, 1993; p. 45. Ashford, Oliver M. (2004). "Richardson, Lewis Fry (1881–1953)". Oxford Dictionary of National Biography. doi:10.1093/ref:odnb/35739. Retrieved 19 January 2008. Hunt, J.C.R. (1998). "Lewis Fry Richardson and His Contributions to Mathematics, Meteorology, and Models of Conflict" (pdf). Annual Review of Fluid Mechanics. 30: xiii–xxxvi. Bibcode:1998AnRFM..30D..13H. doi:10.1146/annurev.fluid.30.1.0. Retrieved 19 January 2008. Lynch, Peter (June 2004). "Richardson's forecast: What went wrong?" (pdf). National Oceanic and Atmospheric Administration (NOAA). Retrieved 19 April 2007. Richardson, L.F. (1939). "Generalized foreign politics". The British Journal of Psychology, monograph supplement No. 23. Richardson, L.F. (1960). Statistics of deadly quarrels. Pacific Grove, CA: Boxwood Press. Richardson, L.F. (1910). "The approximate arithmetical solution by finite differences of physical problems involving differential equations, with an application to the stresses in a masonry dam". Philosophical Transactions of the Royal Society A. 210: 307–357. Bibcode:1911RSPTA.210..307R. doi:10.1098/rsta.1911.0009.